I received a complimentary copy of this book (on request) in exchange for my honest review. Quirky would-be sleuth Emily Castles is back in another fast-paced short story mystery! Emily is thrown into a bit of a whirlwind when she innocently delivers a letter (mistakenly delivered to her own address) to her neighbour: dramatic, attention-seeking Victoria, who immediately has a very strange response. It seems she has been receiving odd, threatening notes pertaining to a video that she made at drama school many years previously with her then boyfriend David Devereux, who is now a well-known actor. We never discover the true nature of this video, except to learn that it isn’t actually pornographic, just an embarrassing performance piece, but Victoria is convinced that it brings bad luck to whoever watches it. Upon learning that Emily’s work contract has ended that day, Victoria immediately invites her to come and help out at her drama school, Showstoppers, which is due to hold its year-end concert the next day. And so Emily finds herself thrown in the deep-end when she arrives at the school the next day where there is most certainly a buzz in the air! Here she meets the calm and collected Seema, who is Victoria’s right-hand running the school. Then there’s the handyman, Dizzy, and the much maligned landlord Mr Barrymore and his dog, Precious. Victoria is unable to focus on much, with her mind being on her upcoming performance in the concert, and having to focus on all her students, and is happy to hand as much responsibility as possible over to a confused Emily, including interviewing prospective new parent David Devereaux. To be honest, Victoria doesn’t come across as the most likeable character. Another poison-pen note has arrived, at the school this time, and Emily teams up with her neighbour, the down-to-earth, no-nonsense Dr Muriel (who happens to be one of the guests of honour at the concert), in an undertaking to discover exactly who is behind them. There’s also a cameo appearance from a policeman who we first met in ‘Three Sisters’, who seems to be quite fond of Emily. However, due to her lack of social know-how, she doesn’t have a clue! I didn’t enjoy this story quite as much as I enjoyed ‘Three Sisters’. I found that there was a bit too much crammed into the minimal pages, not giving as much depth or detail as I would have liked, including no information given about how Victoria reacted when she discovered who the culprit actually was. That said though, it is a short story, so one shouldn’t expect the same detail as one would find in a full length novel. Smith has done a good job in maintaining the continuity of the characters of Emily and Dr Muriel. Emily comes across as even more of a social misfit than in the first book. She is not comfortable in the company of confident individuals, and is not really au fait with social cues. However, this works to her advantage in her attempts at detective work, as she tends to see peoples’ character flaws a lot quicker than most, which might not obvious to other more easy-going, accepting people. One thing which I feel I must mention is a major grammatical error that was glaringly obvious to me. The use of the phrases ‘They might of misunderstood …’ and ‘Must of been …’ instead of the correct ‘They might have misunderstood …’ and ‘Must have been …’. 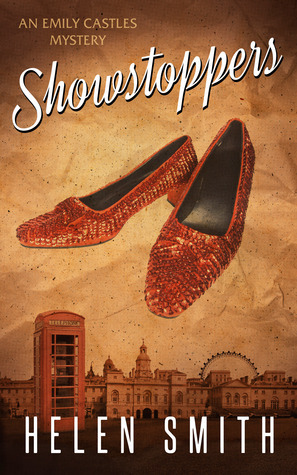 Showstoppers is a quick, light, undemanding read.